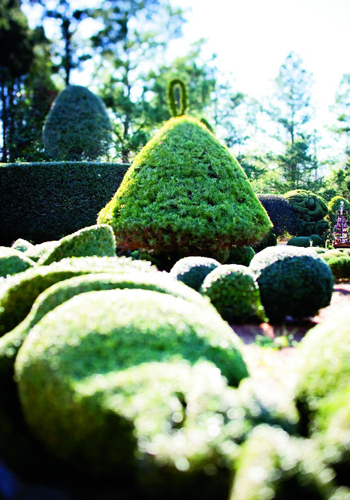 In the town of Bishopville, South Carolina, on three acres of former cornfields, one extraordinary man has planted and pruned, nursed and nurtured a living art museum from thousands of shrubs and trees. "Toto, I have a feeling we’re not in Kansas anymore.” After cruising through the billiard-table flatlands of inland South Carolina farm fields and pine woods, past derelict barns and antebellum plantation homes last painted during the Johnson administration, anyone turning off Highway 15 just outside Bishopville and heading into a small residential development called “Broad Acres” could be forgiven for feeling a bit like Dorothy emerging from her crashed farmhouse and first laying eyes on Munchkinland. 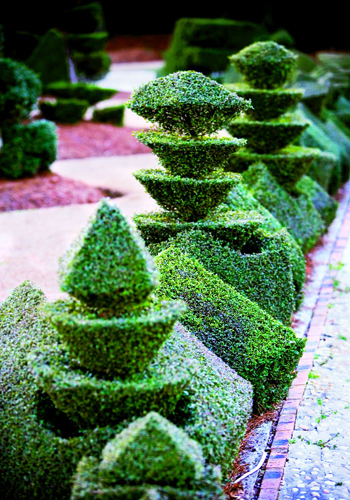 For one thing, suddenly every yard in sight looks as tidy as a putting green, and all the shrubs and bushes have been neatly trimmed into shapes that defy their natural tendency to become, well, bushy. But what really makes this neighborhood so different is that instead of all the “green meatballs” that make so many suburbs look so visually monotonous, nearly all the shrubs in Broad Acres have been trimmed into lively stacks of cones and balls, wavy spirals and interlocking blocks balanced in such dynamic arrangements that the plants look like they’re trying to learn a catchy new dance. It’s peculiar, to say the least, but it’s surprisingly refreshing. One yard, though, is clearly the vortex of this whole horticultural hoedown. From more than a block away, a 15-foot-high wall of contorted green beckons. Leyland cypresses and arbor vitaes alternate with huge junipers clipped into what looks like an armada of tall ships, then calls to mind a line of giant green ballerinas, a row of enormous ideograms from some forgotten Asian language, or a scene from an enchanted forest with the branches waving in the breeze encouraging you to come closer. 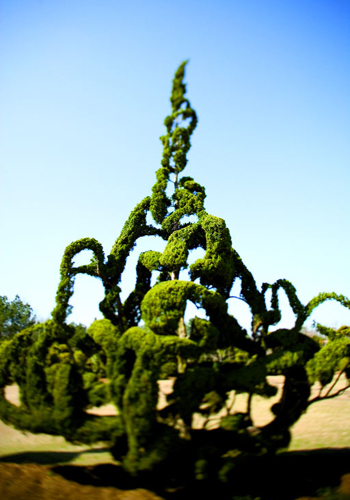 When you do, you discover they form only the leading edge of a wonderfully bizarre world of vegetal sculpture. Behind them lie three acres of shrubs and trees shimmying and cavorting like unique species found nowhere else on earth. 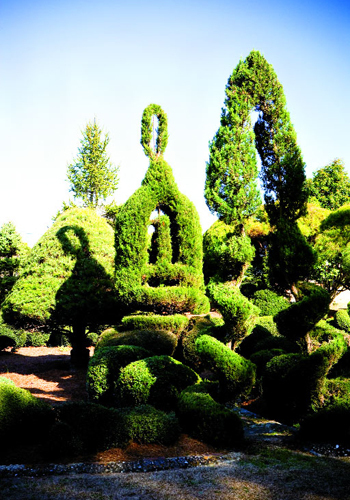 Several thousand individual shrubs and trees of some 50 different kinds of evergreens arch, twist, loop, and intermingle with each other like an energetic dance troupe at a cast party. And on any given day, it’s more likely than not that the host of this party will be out among the crowd, introducing one shrub to its neighbor by gently tying one branch to another or deftly fine-tuning their costumes by shearing a quarter-inch of foliage to sharpen an edge or intensify a sweeping green curve. 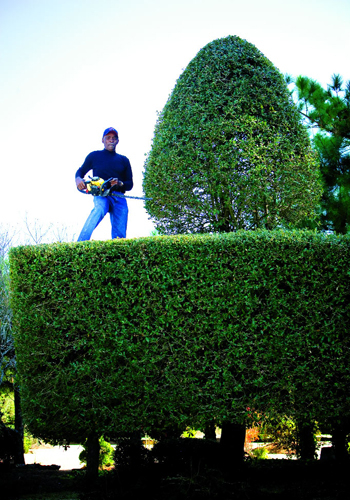 “I never set out to make topiary,” says Pearl Fryar. “In fact, I’d never even heard the word till years after I started. 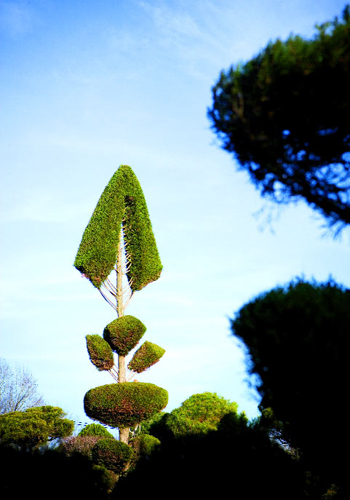 I just wanted to do something different—but I never realized how different it was going to wind up being!” Fryar was nearly 50 before he began planting his first garden and turning shrubs into topiaries, as evergreen plant sculptures are called. 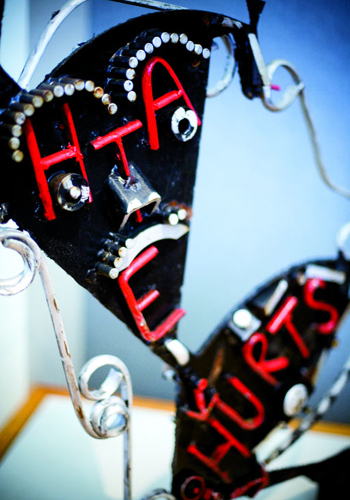 Nowadays he’s recognized as one of the world’s leading practitioners of the art, though he’s entirely self-taught. At 66, he has the rugged, athletic looks that make actors like Morgan Freeman or Clint Eastwood so enjoyable to watch. 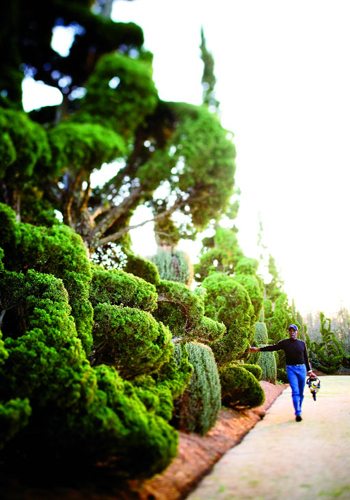 He bounds about his garden in jeans and a knit shirt, a baseball cap completing the retired-sports-star look that his ropy muscles and strong handshake suggest. Though officially retired, after 36 years as a production line troubleshooter for a beverage can manufacturing company, he’s hardly taking it easy. Whenever the weather permits—and whenever he’s not out of town teaching workshops, giving demonstrations, or lecturing at horticultural meetings or art museums (for which he will don coat and tie)—he’s up all day on ladders or one-man scissor lifts, wielding one of his heavy gas-powered reciprocating hedge trimmers with the finesse of a plastic surgeon, or else down on his hands and knees carefully fluffing pine straw around the trunk of his latest creation like he’s putting a newborn baby to bed. From time to time his wife, Kello Se Metra, emerges from the kitchen offering a glass of water or iced tea. “We were childhood sweethearts,” he says. “I fell in love with her in seventh grade when we were both living near Clinton, up in North Carolina. After I finished college in Durham and earned my degree in math and chemistry, I got drafted and sent to Korea with the Army as a chemical warfare specialist. As soon as I got out, though, I headed to Queens, New York, where Metra was working as a seamstress. By then she’d saved up $500. “But by the time I got to New York, I had only $7! I asked her to marry me anyway, and for some reason she agreed. Later on, after I asked her why she had agreed so quickly, since she was already doing so much better than I was, she told me, ‘I married you because you had potential,’” Fryar laughs. “And in 40 years of marriage, she’s never yet said, ‘You have finally reached your potential’—so I guess I’ve got to keep trying!” Two years after they married, they had a son, Patrick, who is now 36 and lives nearby. While they were in New York, Fryar found a job with the American National Can Company. After working his way up in the company for several years, he was sent to Atlanta, and then in 1976, to Bishopville. By 1980 they had decided to settle permanently there and bought a double lot in what was then still a cornfield. “Part of the agreement with the seller was that I wouldn’t build our house till after they’d harvested the corn one last time,” he says. Once they had moved into their new ranch-style brick home, Fryar was ready to make a name for himself in the area. “He who never does more than average will never rise above the average” have long been his watchwords, and he was determined to be anything but average. It all began with a contest. The Bishopville Garden Club’s “Yard of the Month” contest, in fact. 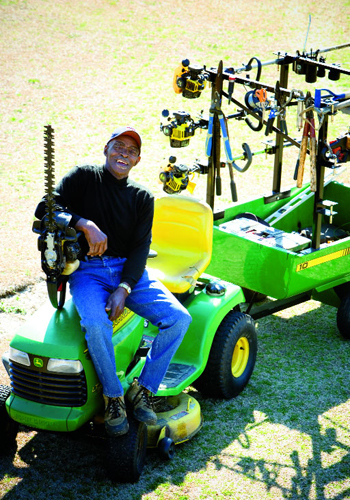 After growing up on a tenant farm as the son of a North Carolina sharecropper, and then spending decades living in a series of rental properties while he climbed the factory ladder, Fryar was proud to be a homeowner at last, a self-made man and a living example of achieving the American dream. So he decided to enter his home in the competition. 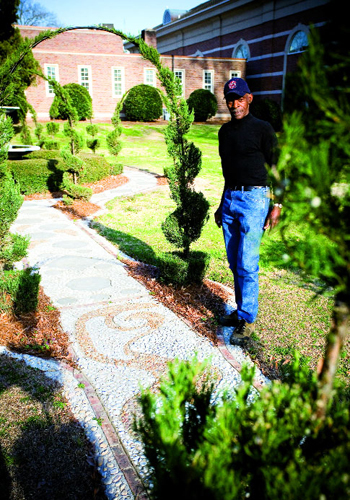 He took 10 months, working after-hours and weekends, to construct a curved driveway embedded with bricks and pebbles arranged in decorative patterns, then planted neat hedges and rows of small pines around the sides of the yard, laid out flower beds, and put in ornamental trees. He began scouring the area for more unusual plants. At a nursery in nearby Camden, he found a small potted shrub that had been trimmed like a stack of pom-poms. The nursery owner refused to sell it, but then offered to show Fryar how to copy the effect. 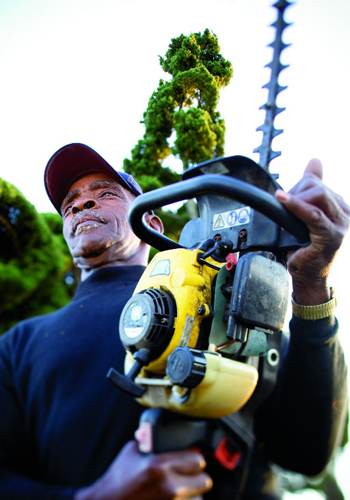 He sent Fryar home “with three minutes worth of instruction and a $2 holly.” That evening, he began trimming it with a pair of hand pruners. Something about working with that small plant and transforming its shape struck a chord deep within him. He attempted another form with one of the other plants already planted in the yard. And then another, and another. 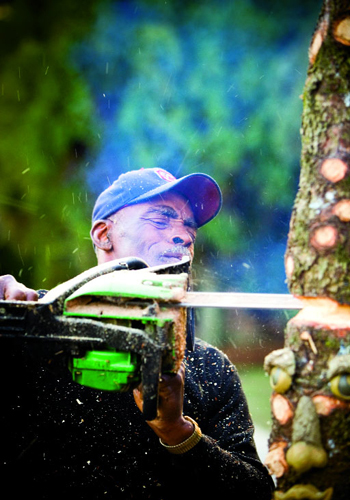 “I really had no idea what I was doing, but at some level it was satisfying to me,” he says. “Once I got started, I couldn’t stop.” A latent artistic bent, one that had lain dormant all his life, had suddenly emerged. Gradually he created a technique that owed far more to his years as a problem-solver for the container factory than to traditional gardening lore. “If a machine breaks down at the can plant, it’s costing the company hundreds of dollars a minute. You have to do whatever it takes to get that line moving again.” To get shrubs to take on the shapes he wanted, he applied the same logic and inherent ingenuity. In order to make a juniper spiral, he learned to wrap a black string around it and then clip away the foliage down to the string. To build an arch from a pair of adjacent hollies, he figured out a way to set black PVC pipes in the ground, bend them to make the basic shape of the arch, and then attach shoots from the shrubs with zip-lock ties. By pruning back the rest of the limbs, the growth energy of the plants would be focused on these new “leader shoots,” and the pipes were soon hidden by new leaves. Once the new growth had hardened in place a year or two, the pipe could be removed, leaving the shrubs to support one another. “Gardening books will tell you that some of these things can’t be done, but I had never read them when I got started,” he says. “Not knowing ahead of time that something is supposed to be impossible often makes it possible to achieve. I didn’t have any limitations because I really didn't know anything about horticulture. 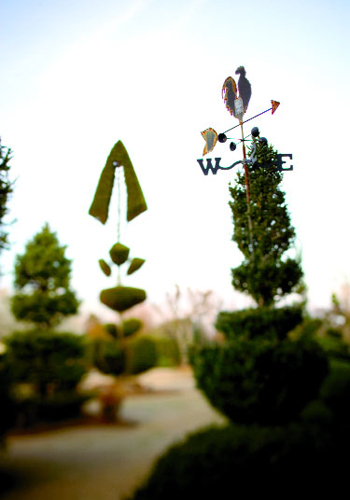 I just figured I could do whatever I wanted with any plant I had.” After hollies, he began seeing what he could do with pines, oaks, hemlocks, camellias, pyracanthas, spruces, and yews—indeed, anything that seemed able to thrive in his garden. At the same time he was learning to train the limbs and foliage of his shrubbery into the shapes he imagined, Fryar came up with his own ways to train the roots as well. All the shrubs and trees in the yard are encircled by neatly trimmed trenches dug a few feet from the trunk. Not only do these make a clean break between the lawn and the shrub plantings and serve to help retain whatever rainwater falls, but as the roots extend outward and encounter them, they are forced to head downward, toward the moister soil deeper in the earth, instead of tapping into the surface moisture of the lawn. As a result, Fryar never needs to water his garden. “I might water a plant occasionally during the first two weeks after I put it in the ground, but after that it’s on its own,” he says. 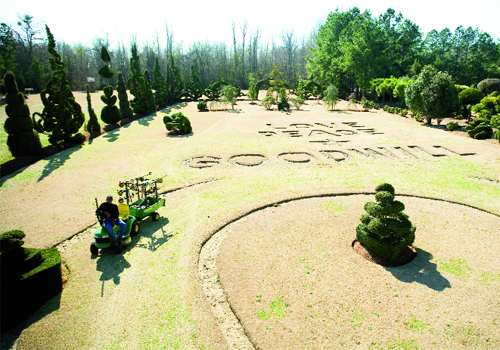 A deep bed of pine straw hilled up around each plant (along with any trimmings from the plants themselves) provides a cooling mulch, slowing surface evaporation and helping eliminate weeding. Here again, it’s the plant’s struggle to survive which forces it to do as he commands, but it also results in a healthier plant in the long run. For similar reasons, Fryar never sprays or fertilizes, either. 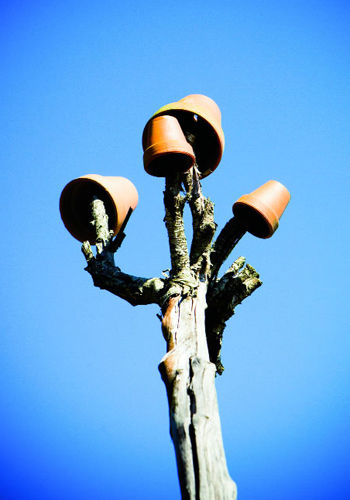 Plants that can’t adapt, or that succumb to pests like wooly aphids or spider mites, are treated like the losers in a kind of “garden Darwinism.” They are simply discarded to make room for more well-adapted shrubs, or else, if large enough, their dead trunks become bottle trees, “flowerpot trees,” supports for other plants, or even quirky totem poles that he carves with a chain saw. By 1985, Fryar was ready to enter the local yard competition again. 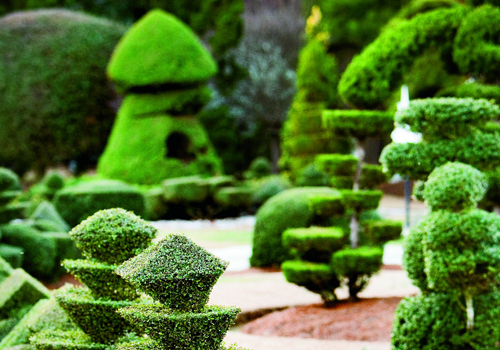 Several hundred topiaries like no one had ever seen graced his three-acre lot. 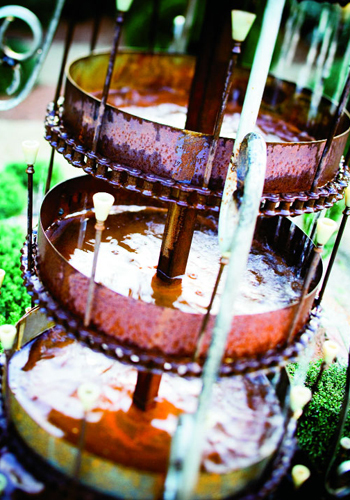 Fountains gurgled in secluded corners of the yard. The address of the house was spelled out in dwarf yaupon topiary numbers on the front lawn, and a swath of grass had been engraved with the words “PEACE, LOVE & GOODWILL” 40 feet wide, outlined in vinca and verbena flowers. This time, the garden club committee indeed felt obliged to make an exception, and named him the winner. 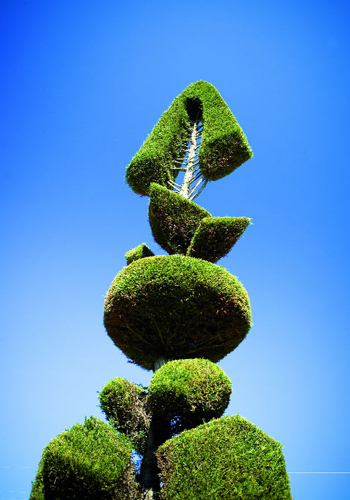 Rather than relax after finally receiving local recognition, however, Fryar began taking on still more self-imposed topiary challenges. Each evening, after a long day at the can factory (often 12 hours or more), he would climb onto a ladder strapped to the bed of his pickup truck and work on even bigger projects under portable flood lights. 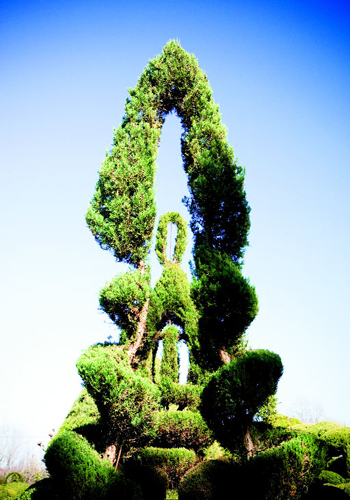 Using his homespun techniques, he transformed a 20-foot Leyland cypress from its natural cone-shaped habit into something resembling a giant feather or fish skeleton. 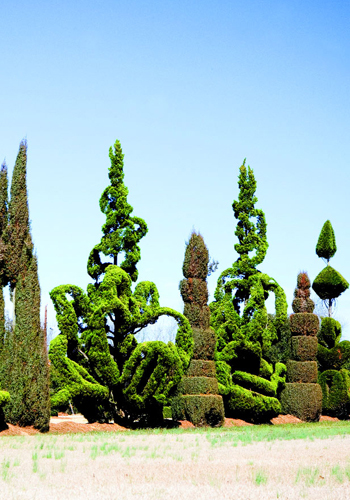 He sculpted Hollywood junipers two stories tall and 25 feet wide into the giant forms visitors now call “the ships.” Other shrubs became hearts-within-hearts, mushrooms, loops, corkscrews, or individual standing letters spelling out the word LOVE. And meanwhile word of the garden began to spread. By the mid 1990s horticultural enthusiasts had begun showing up from as far away as Europe and Japan, eager to find out how a self-taught gardener had accomplished so much in such a short time. 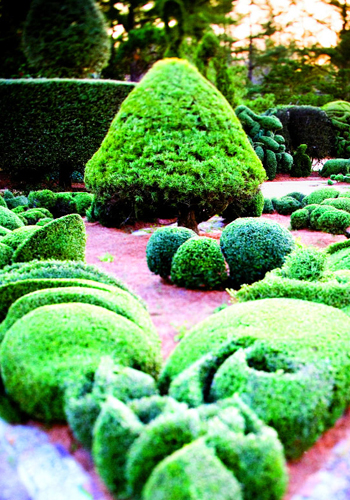 After all, world-famous topiary gardens like Kyoto’s Toji-in or Shisen-do, Beynac or Beize-le-Châtel in France, and Levens Hall or Nymans in England were of a comparable compact size, but had taken generations of dedicated monks or trained gardeners centuries to accomplish what Fryar had achieved in less than a decade, working entirely by himself in his spare time with the cheapest available plants. 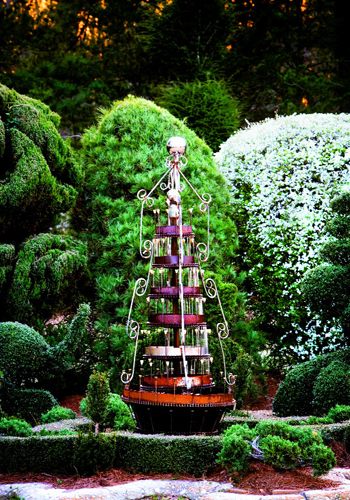 Even relatively young American topiary exhibits like those at Ladew Gardens in Maryland, Longwood Gardens in Penn­sylvania, or Disney World in Florida involved teams of skilled professionals with very deep-pocketed sponsors to absorb the costs. For Fryar, 1997 was a banner year. Polly Laffitte, then Curator of Art at the South Carolina State Museum in Columbia, arranged for examples of his “living sculptures” to become part of the museum’s permanent collection. Other institutions, like the Museum of Fine Arts in Boston and the American Visionary Art Museum in Baltimore, soon followed suit by including Fryar’s work in their exhibitions. His accomplishments haven’t escaped the attention of the media, either. He’s appeared on HGTV’s Garden Diary, PBS’s Victory Garden, and on CBS’s Sunday Morning, as well as on the pages of magazines like Fine Gardening, Garden Design, and Veranda. 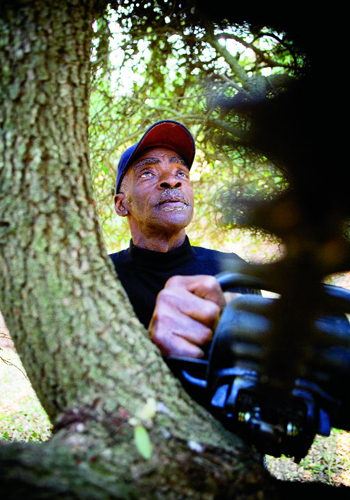 In 1997 he was invited to participate in the Spoleto Festival’s “Art & Landscape,” exhibit, and his Heart Garden still exists in the Philip Simmons Garden on Anson Street. Perhaps his most cherished recognition to date occurred when his garden was one of four selected to appear on the Turner-South network’s Blue Ribbon show. Viewers were asked to choose between Brookgreen Gardens near Pawley’s Island, Bellingrath Gardens in Mobile, the Biltmore Estate outside Asheville, and Fryar’s three-acre lot in Bishopville. An overwhelming 54 percent voted his garden their favorite. Going into the house once more for another glass of iced tea, Pearl turns to his wife and says, “What do you think, Metra? Have I lived up to my potential yet?” She smiles back at him, but doesn’t say a word. Don’t listen to criticism. You could be standing on the corner handing out $100 bills, and still someone would find something to criticize about it. If someone says you can’t do something, just ignore them. They’re only talking about their own limitations. You’ll never get attention by just being average. Instead of just thinking outside the box, jump off the box entirely! Knowledge without work is useless. But hard work, even without knowledge, will eventually pay off. If people see you trying hard to achieve something, sooner or later some of them are bound to try to help you. I’m having fun and I feel good because I think I’m making a difference in a few people’s lives. And that’s what life is all about. I enjoy what I do. If people want to call it art, that’s their prerogative. For me, it’s fun because it’s a challenge. Take I-26 West approximately 50 miles to I-95 North. Then head toward Florence for another 60 miles, to exit 146. Take highway 341 North (left, toward Lynchburg). Proceed on 341 beyond Lynchburg to Bishopville. In downtown Bishopville, turn left on Highway 15 (South Main Street). Go a little more than a mile and turn right, just beyond Piedmont Cemetery, on Broad Acres Road. 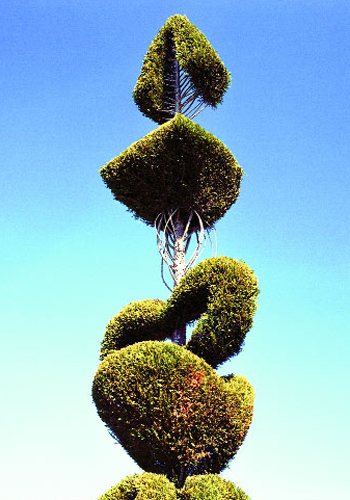 You’ll see small examples of his topiaries on either side of the highway. Pearl Fryar’s house has the numbers 165 (the old number) spelled out in the front yard. It’s okay to visit anytime during daylight hours. Just park and walk around. The gardens are free, but donations are welcomed. To contact Fryar ahead of time or to schedule a group, visit www.fryarstopiaries.com. Other things to see while you’re in the area include Bishopville’s Cotton Museum (www.sccotton.org) and Dalton Stevens’ Button Museum (www.scbuttonking.com), which also features bluegrass jam sessions every Friday evening at 7 p.m. 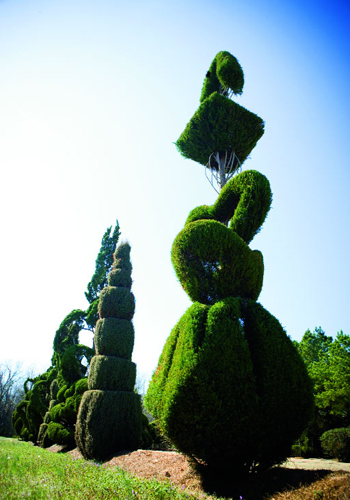 Check out Pearl Fryars's "Topiary Master" video here.